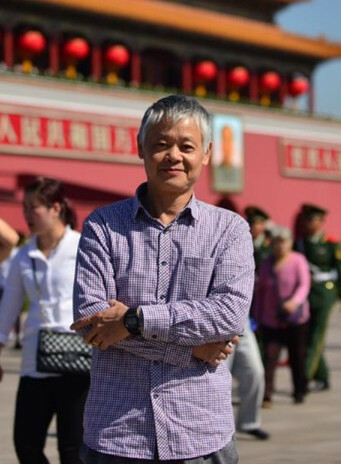 Wang Zirang is a member of China Artists Association, Chinese Painting Research Association, Modern Chinese Painting and Calligraphy Association, Xin’An Calligraphers Association and president of Huang Binhong Painting Institute. 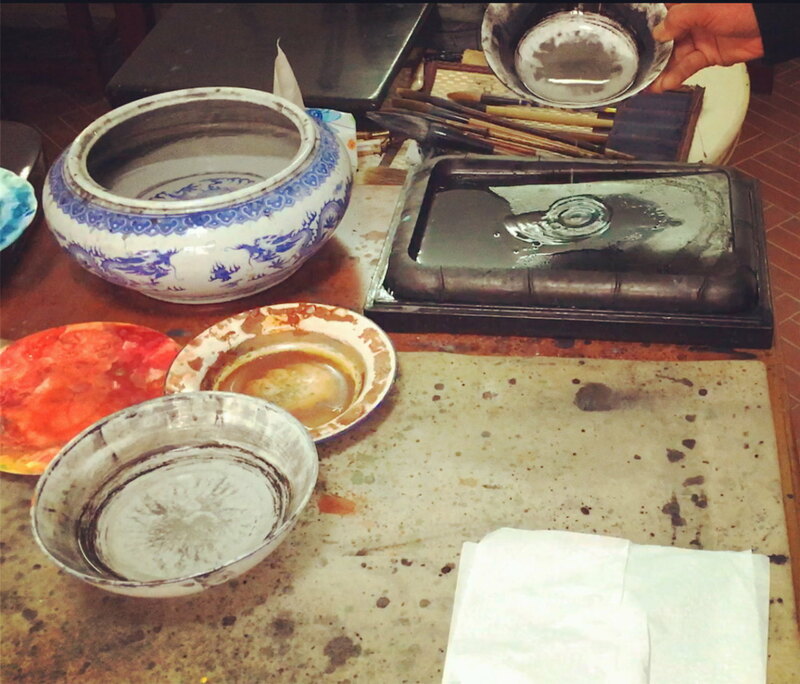 Shexian, includes old Huizhou, near Huangshan (Yellow Mountain) in Anhui province which has long been recognised as one of the most important centres for Chinese painting, as well as home also to Old Hu Kai Wen Ink workshop and traditional inkstone workshop. The beautiful city of Huizhou has been home to a lot of intellectuals and many famous painters in Chinese history. Wang Zirang was born here into a business family more than 60 years ago. With such an influence, he became interested in Chinese calligraphy and paintings at very young age. 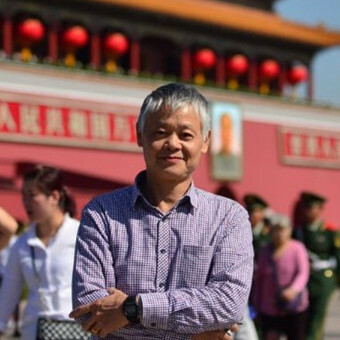 While working in local government, he spent any spare time available continuing to paint, exhibited in national art exhibitions with representative works such as “Huizhou impression”, “Longchuan”, “MaoMeng hometown” securing his membership of the China Artists Association. Wang Zirang is highly influenced by Huang Binhong (黃賓虹) (1865-1955), one of the most famous artists in Chinese history who also originated from this area. 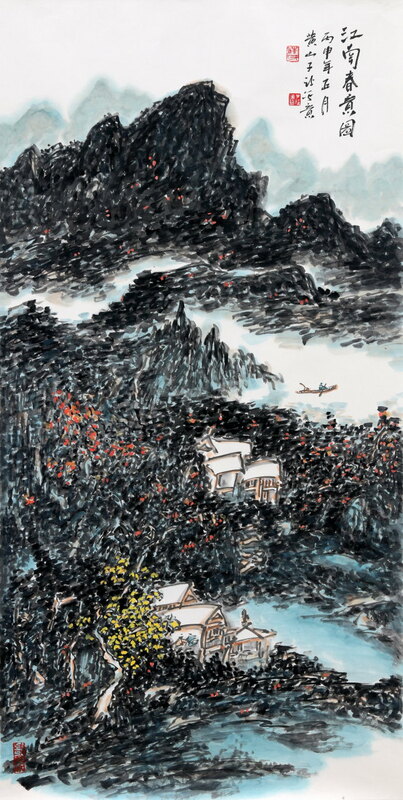 Huang Binhong is famous for using “Su Ink” (overnight inks) to paint Chinese landscape paintings. To both Huang Binhong and Wang Zirang, mastering art materials is essential for good calligraphy and paintings. In this article, Wang Zirang is going to tell us how to use Xuan Papers, brushes, inks, and ink stone. Rome wasn’t built in a day [Chinese: 3 feet of ice isn’t formed in one day], painting needs time to practice and figure out how to do it. Sometimes the creation of a large painting takes 1-2 months from sketching, testing of different materials to final painting. Painting should be a hobby and an interest, skill is needed with pen and ink, effort and artistry with warm affection to capture the true emotion of Nature. Persistence and perseverance is also very important. People crazy for painting need to get outside into Nature, to understand the nature of the mountains and rivers, plants and treed, to observe changes in the different seasons of nature and find inspiration in careful thought and sentiment. Use your own pen and ink and effort to express on the Xuan paper your experience, feeling and understanding of the natural world up in the mountains, communicate to others your wishes, thoughts and emotions. Creativity should take life as it’s source but aspire to something larger than life. Chinese painting and calligraphy use Xuan paper. The thousand year old paper is Xuan paper which can be kept forever. This paper is very different from other papers and allows a large number of Chinese paintings and calligraphies to survive for thousands of years without any chemical treatment. Fine Xuan paper is generally produced by Chinese specialists such as the fine Red Star company paper. But beginners who don’t yet know how to use Xuan paper can use any common type of Xuan paper to practice. After you have mastered Chinese painting techniques, then you can use the special Red Star paper, that would be the recommended sequence. 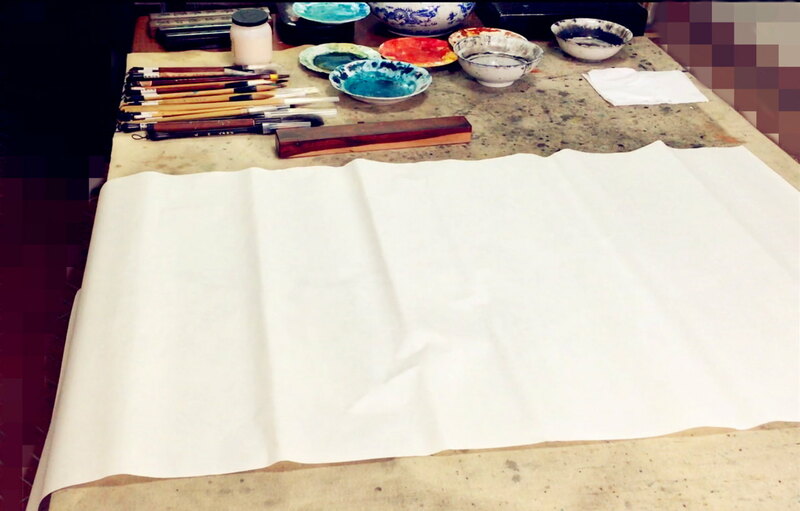 Chinese painting and Western painting are not the same, once you start Chinese painting on Xuan paper, you cannot modify it much otherwise the surface becomes “dirty”. Anywhere you place your brush is recorded directly leaving traces of the brushstroke since Xuan paper has higher water absorption rate than most other papers. Of course Chinese painting uses ink but you also have to have to be proficient in the technique and rules of using ink well. In contrast, oil painting can be adjusted and modified throughout the creative process. Each has its own distinctive features. Learning to paint on Xuan paper seems to be very complex and interesting. Xuan paper is divided into Raw Xuan (生宣), “Cooked” Xuan (熟宣), half-raw/half-cooked and so on. Xuan paper can also be graded into different types according to the bark content. Different types of paper are suitable for different types of painting and calligraphy. This process although it may seem repetitive is in fact very interesting. Once entering this field, it is like entering another world, your eyes will be wide open not wanting to miss any point. Ink stick made in 1980s at Old Hu Kai Wen factory. Hui ink (徽墨) is a speciality of China’s SheXian (old HuiZhou徽州), it is of excellent quality and beautiful to look at. Because it “drops on the paper like polish, and stays true 10,000 years” (“落纸如漆，万载存真”), the works of history’s famous artists and calligraphers remain perfectly preserve and became precious artistic heritage. Shexian is the birthplace of Hui ink. Since South China Tang dynasty Li TingGui (李廷珪) when there was a gold tribute paid in ink it became known as “ink town” or “ink capital”. Shexian is history’s Xin’An 新安 county of Huizhou (歙州) and SheZhou (歙州) was the seat of government. So Hui ink takes it’s name from HuiZhou. Shexian produced many famous historical calligraphers, taking advantage of the good quality ink. The concentration of ink workshops was unparalleled in the world and praised as “She ink the crown of all under heaven”, in history onwards, Shexian has produced thousands of famous calligraphers and Hui ink made a great contribution to the development of calligraphy. And that’s by no means the whole story. There are many varieties of Hui ink, especially the useful black inkstick, large numbers which are also the same shape, so how to identify them? Generally standard Hui ink is light to hold, delicately scented, and rubs smoothly. To identify the ink, firstly look at its appearance, secondly distinguish the colour of the mixed ink. Ink is very important for Chinese calligraphy and painting techniques. 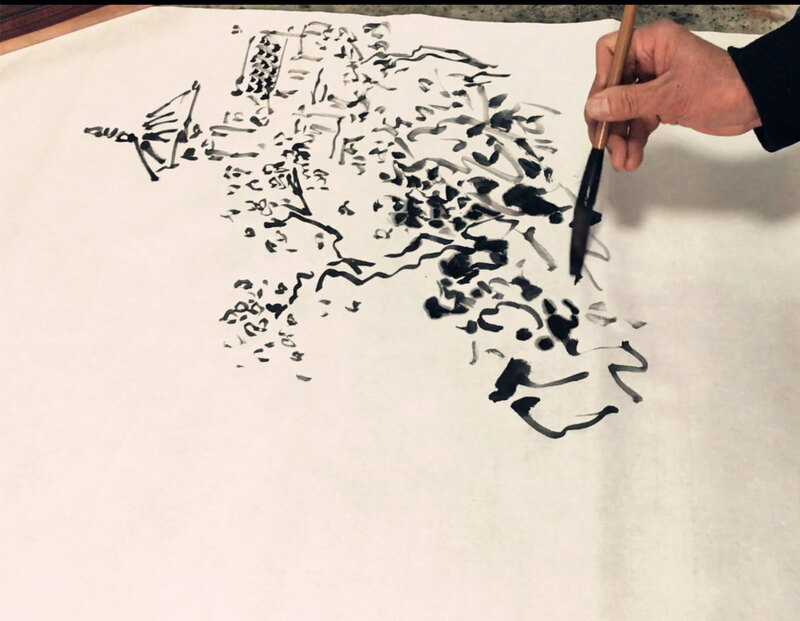 Because of Hui ink special characteristics you can use light and thick, hard and soft strokes, this is very useful so it has become one of the main tools for the artists to express their skill. In painting, ink can be thick or light, the ancients used to classify five grades: charred, concentrated, heavy, light, clear (焦、浓、重、淡、清 – Jiāo, nóng, zhòng, dàn, qīng), these are the so called “five colours of ink” “墨分五彩”. From these five colours can be created the harmonious effects of light and shade, closeness and distance, volume and texture, transparency and colour. Painters rely on these “five colours” to express their style, artistic and spiritual interest. To summarize general ink technique: grind ink for thickness, add water for lightness, rinse the brush in clean water, dip into concentrated ink and your works won’t come out grey. To make good use of Su ink, pay particular attention to this. Black Ink for painting is from oil soot, should be thick not over-diluted, light without losing consistency; calligraphy ink is from pine soot, matt and non-reflective, black and deep. Pine soot ink is not ideal for painting, after diluting it can turn gray and less glossy. Some works require both dark and light effects and can use both oil soot and pine soot inks together for good results. There are two methods for rubbing ink, pulling and twisting (ie rubbing up and down, or twisting rotation). To achieve the special effects special effects of chinese painting it is best to mix you own ink and use little or not at all the ready prepared ink (墨汁). Take out the ink stick, sprinkle a little water on the inkstone and slowly grind a little ink, then dip the brush into the ink and you can start painting. 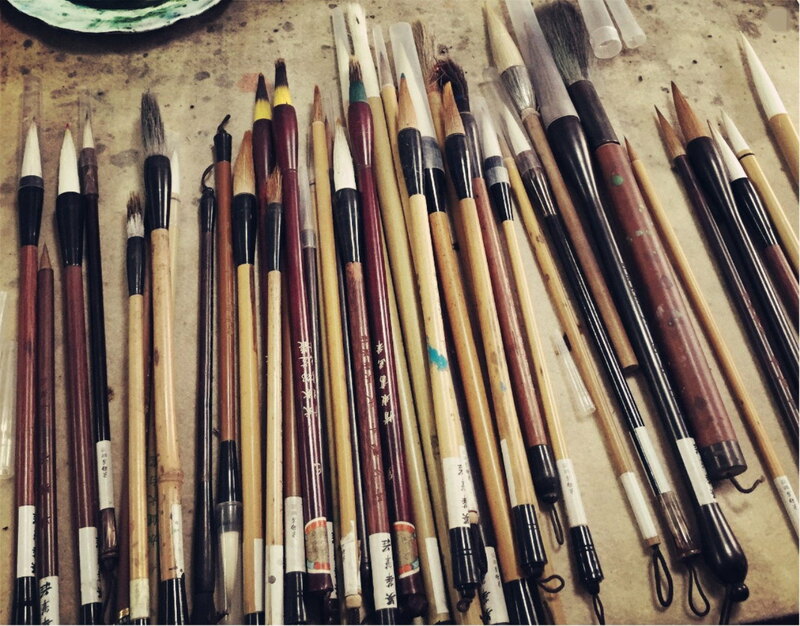 Chinese painting requires various kinds of brushes. For example, some brushes are made with wolf hair [actually weasel – see explanation on brush materials] , some with rabbit hair. Different sizes and types are suitable for different painting styles. Brushes can be categorized as large, medium, and small. You should choose the proper brush for different purposes. For example, to do large regular script Kai Shu (楷书) calligraphy, it is better to choose a brush made for big Kai (大楷); however for small calligraphy, a specific Small Kai brush would be good. Brushes for painting should have long hairs because long hairs can absorb more liquid than short hairs, and because long hair is more flexible than short hairs. Normally you should prepare the whole set of brushes of different sizes. Wolf hair is more elastic than other hairs, therefore it is very flexible; wool has very high absorption rate, less elastic than wolf hairs. Since wolf hair can absorb a lot of water, it can be used for long time without having to continually dip it back into the ink. When holding a brush be careful not to hold it too tight. Some beginners hold the brush with too much tension, which won’t be good to learn: you need to practice holding the brush well. Studying painting you should prepare brush, ink, paper, inkstone and books. Normally students go through several learning stages, first learning to copy rocks, trees, mountains, grass, houses etc. Once students are competent in copying then they can start free sketching, and then creation of new works, and in the long term find their own creative skill and their own language of brush and ink. The creative process of painting is difficult but joyful, lonely but happy. Once a satisfactory work is completed successfully, this kind of joy makes people very happy. For more stories and information about brushes, please click and read Xuan Brushes. Inkstones can be made from different materials. 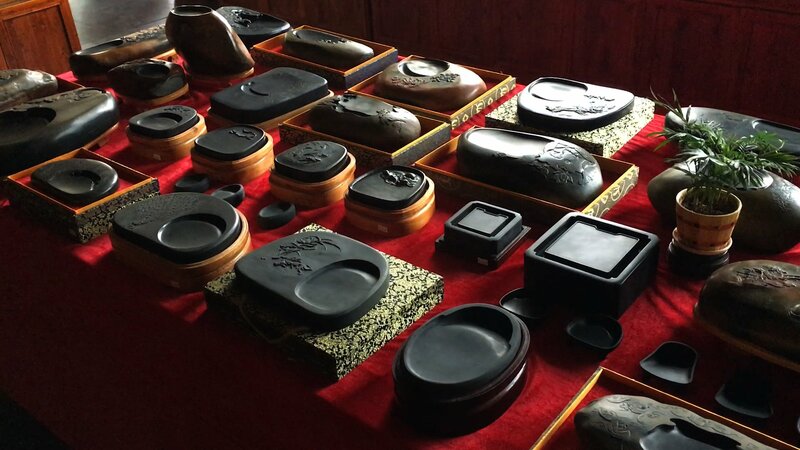 Sheyan (歙砚 Shexian inkstone) is one of the most collectible ink stones in China. Sheyan has been famous in China since the Tang Dynasty over a thousand years ago. Sheyan production was named Shezhou (歙州) as historically Shexian (歙县) was known as Shezhou and then Huizhou (徽州). Some people treat Sheyan inkstone as a sacred relic not be be shown to the world, others say Sheyan is a great inspiration for the Xin’An school of Shanshui (山水) landscape painting: “黟歙之珍，匪斯石也” – “ebony Sheyan treasure, unlike other stone”. Sheyan has many variations, there are gold or silver stars, rings, lines or other striations. Apart from choosing the effects of the rare precious stone, there are also wonderful artistic sculptures. Contemporary great inkstone carvers include 汪律生、方建成、胡震龙、王祖伟 (wāng lǜshēng, fāng jiànchéng, hú zhènlóng, wáng zǔwěi) and so on. Sheyan is not only a useful tool for Chinese painting and calligraphy but also an artistic treasure in its own right. It has a very high artistic value and also a solid value from its usefulness. There are many nice stone types, finely carved Sheyan inkstones are treasured by collectors and most are for use on the study desk. 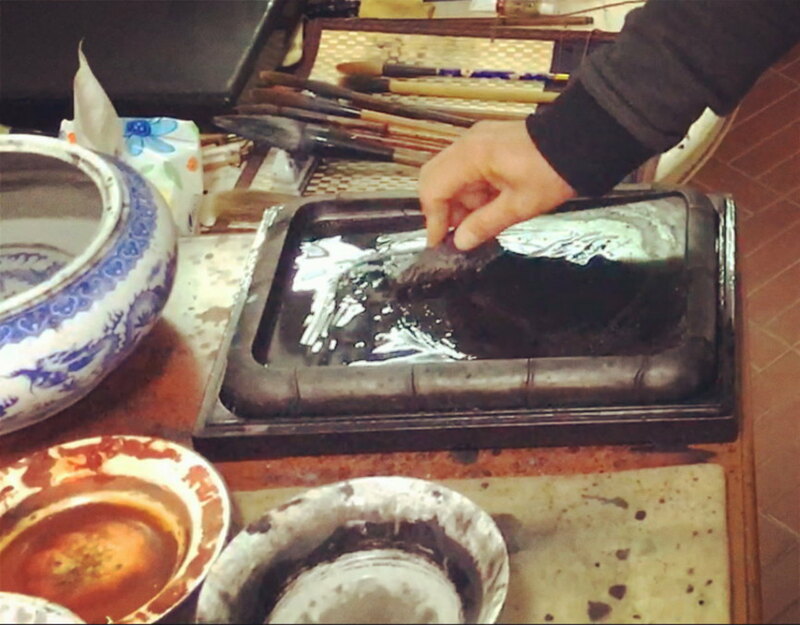 When using, put a little clean water on the inkstone, rub the ink stick on the stone, good ink ground on a good inkstone will produce very fine ink, that’s how we use it to make ink. If you are using an ordinary ink, be careful when rubbing it, listen for a scratching sound: if you can hear that the ink has stony impurities, take it off or it would damage the stone surface. If you used oil soot ink on damaged stone, check how the ink goes onto the stone surface, you can’t let the ink stay on the the stone face otherwise if the ink dries on the surface the stone could be damaged getting it out. Sheyan should be rinsed frequently “宁可三日不洗脸，不可一日不洗砚” “I would rather go without washing my face three days rather than miss cleaning my stone one day”。Sheyan is best left to keep itself moist, don’t put in the sun or oven to dry, don’t store with wet ink. If you have to use Su ink, cover with a lid to avoid dust entering which would affect the ink purity. When you are cleaning Sheyan inkstone, you should just use water and wipe gently, don’t use hot water or oily water. For more about inkstones, please click and read Ink Stone, a work of art used for making art. Su ink means ink from previous days: the mixed ink can be left for a day or two to dry out so it is thicker but still liquid. Then when we need to use it we only need to add a little water to mix the old inks. Su ink is also available in market in bottled form. Freshly-mixed ink and Su ink can have very different effects. I’m expert in Chinese Shanshui (山水) landscape painting, and urban landscapes, often using brush to make outlines, points, the “cun” (绘) method of showing the shades and texture of rocks and mountains by light ink strokes in traditional Chinese landscape painting and “ca” (擦) brushstrokes. Using ink, pay attention to “积、破、渲、染” [age, quality, wash, dye]. Use flexible clever technique for line drawing, ink painting and so on. 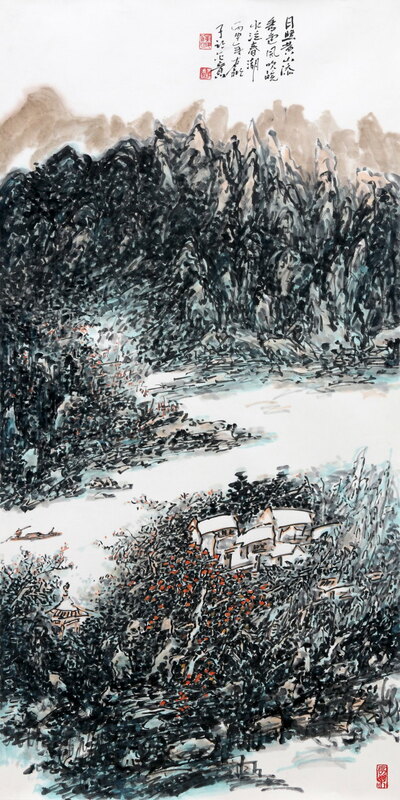 For a long period of chinese painting, Su ink has developed many techniques and skills, for example Xin’An painters work is completed with Su ink, the general appearance using water and ink is thoroughly clean, vigorous, glossy and artistically vivid. Hui ink has the effect mentioned previously “drops on the paper like polish, and stays true 10,000 years”, Su ink in the traditional sense is ink left on the inkstone overnight to make itself, although these days it is also possible to buy pre-made in the market. Beginner students should start to master the techniques for painting trees, rocks, water, clouds, scenery, grass and so on, then they will be better able to grasp the composition of Shanshui landscape painting, the skills of Chinese brush and ink painting and at the same time they can try to use Su ink to paint. Chinese painting brush uses a variety of techniques with different parts of the brush (中锋、侧锋、顺锋、逆锋、藏锋、露锋 and so on) there is such great flexibility that it takes skill to master it. Generally speaking, use a small amount of Su ink with a small amount of clear water, rinse the brush with clean water, then use the brush tip to soak up a little Su ink, then use the brush on the Xuan paper, using the traditional “笔笔清” clear brush technique, should produce good results, dry, wet, thick, light or moist, all will be produced naturally. Be careful on the turns when doing the drawing. Here I am painting impressionistic landscapes, as a demonstration. In this way you can draw down your ideas in one go, continuously drawing until you are satisfied. For su ink it is very important to use water otherwise the painting surface becomes “dirty”. Su ink painting has a thick black and bright texture. Sometimes you can use two different blacks to create a painting, this effect is also good, this is according to ones own preferences and the needs of the painting. When painting, pay attention to the white space, use the black ink to create white space “from the black make white, from white make black” “以黑制白、以白制黑”. Freehand painting attempts to achieve a an impressionistic effect, apparently formless close up but stepping back creates a beautiful view. Painting Shanshui landscapes, pay attention to the local scenery, adding some houses, little bridge, pavilions, also known as Bridge River Home (小桥流水人家 -“small bridge over flowing stream and household” ). If the painting is in colours, wait for the paint to dry before doing the next colour. Painting paintings is a type of exercise, you can express your own love of the natural world, it doesn’t matter which tribe or culture, everyone can communicate through painting. A good Chinese painting needs good brush, ink, paper, stone as tools to support it, and give full expression. Landscape painting normally use these natural colours: red, green, yellow, orange, etc. If you do Gong Bi Hua, you will use more colours. Normally you should create your colours by combining different colours according to the needs of your painting. I normally use water and ink, as well as color. Because Chinese landscape paintings are normally expressed through water and ink. You have to understand well the traditional use of inks and add your own characteristics into the colours. This is a Xin’An landscape by Wang Zirang original size 1.36×0.68m, showing the beauty of the sun on Huangshan and the wind and spring water of Anhui. This painting uses the two kinds of ink, the fresh ground ink and the Su ink, the picture is heavily painted and the lines flow smoothly. This house is treated as the central point to the whole picture. The thick woods and the simple brushstrokes of the house form a strong contrast. The painting density, thickness/lightness, complexity/simplicity are handled properly. The white area in the center of the painting is a broad flowing river. On the water people are punting a small boat which adds a sense of movement, a sense of the breath of life which appears to draw people into the picture to enjoy it. Ink painting of Yunshan (雲山 Cloud Mountain), the full landscape adds beauty. Painting misty rain with brush, the whole scene emits poetry. Size: 1.36×0.68m, author Wang Zirang. This is a Chinese painting depicting Anhui southern countryside, using traditional Xin’An painting techniques. A farmer is freely wandering along the country lane, in front are the beautiful landscapes, apparently a heavenly wonderland. On the upper left side there is a pavilion painted to draw the eye, step by step climbing up the hill. The meaning is that life has a long journey to go ahead. At the same time the pavilion has another meaning, to take a break on the journey of life (亭 “pavilion” and 停 “stop” are similar characters both pronounced “tíng”). Temporarily set aside your worries and rest. It suggest people should pay attention to rest and recuperation, and then continue again with high spirits, up to the mountain top. This is a Xin’An impressionistic Shanshui landscape painting. This paper is Red Star Xuan paper. The longer you preserve the Xuan paper, the better the paper will become. When you paint on the old Xuan paper, the paper will reveal the best effects of ink. Xuan paper has little cotton and a lot of tree bark. Therefore, the paper is very good. This paper is around 20 years old. Now it is great. This painting is also done with Su ink and fresh ink. This painting, I use different brushes to create the local village. This is Huangshan (yellow mountain). However, I didn’t want to show the mountain, instead, I want to draw the daily life of local people. I let Huangshan surround the village in order to show that the spirit of the mountain has been influencing the local people. Also, I added pine trees in these places. This painting is full of stories which can keep you reading all the time. The ink in this painting is also very vivid. Mountain peaks with abundant water flow. Chinese painting, painted with Su ink and fresh ink. Both traditional and innovative the picture shows the Anhui Xin’An landscape and beautiful scenery, it is a very successful good work. Click Wang Zirang Chinese Painting Collection: Joy of Su Ink for more paintings.